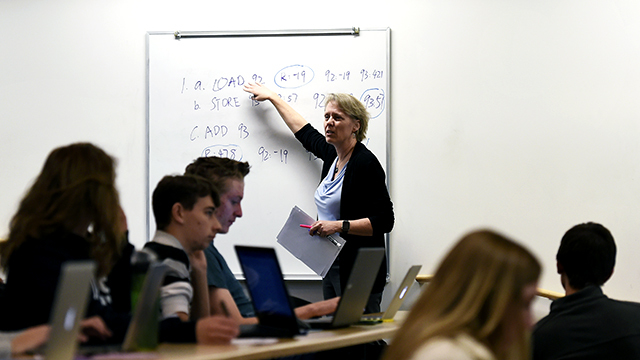 About six-in-ten Americans (61%) say the higher education system in the United States is going in the wrong direction, according to a new Pew Research Center survey. But Republicans and Democrats differ over why they think this is the case. About three-quarters (73%) of Republicans and those who lean to the Republican Party say higher education is headed in the wrong direction. 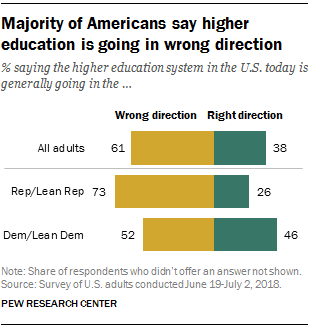 Democrats and Democratic leaners are more evenly split – 52% say higher education is going in the wrong direction and 46% say it’s going in the right direction. Among Democrats, younger adults are the most likely to offer a negative opinion: For example, 61% of Democrats ages 18 to 34 say the higher education system is going in the wrong direction, compared with 48% of Democrats ages 50 to 64 and 40% of those 65 and older. Meanwhile, 54% of Democrats ages 35 to 49 say the same. Partisan differences in attitudes about the direction of the higher education system are consistent with findings from 2017 Pew Research Center surveys, which found that Republicans feel colder toward college professors than Democrats do and that Republicans have grown increasingly negative about the impact of colleges and universities on the direction of the country. Views on the state of the higher education system also differ by educational attainment. Those with a bachelor’s degree and no further education and those who attended but didn’t finish college are particularly likely to say higher education is going in the wrong direction (64% and 67%, respectively). Smaller shares of those with postgraduate degrees and those with a high school diploma or less say the same (56% in each group). Among Americans who say the country’s higher education system is going in the wrong direction, 84% cite high tuition costs as a major reason why they think this is the case. About two-thirds (65%) say students not getting the skills they need in the workplace is a major reason, while roughly half cite colleges and universities being too concerned about protecting students from views they might find offensive (54%) or professors bringing their political and social views into the classroom (50%). 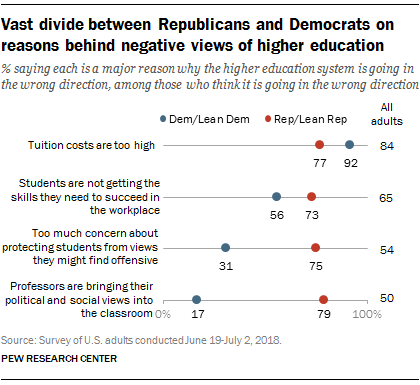 Republicans and Democrats are worlds apart when it comes to some of the reasons why they think higher education is going in the wrong direction. Among Republicans with this view, three-quarters or more cite professors bringing their political and social views into the classroom (79%) and too much concern about protecting students from views they might find offensive (75%) as major reasons. Relatively small shares of Democrats say the same (17% and 31%, respectively). Majorities of Republicans and Democrats who say higher education is going in the wrong direction cite inadequate workforce preparation and tuition costs as major reasons why, but here, too, there are some partisan gaps. About three-quarters of Republicans (73%) say one major reason higher education is off track is that students are not getting the skills they need to succeed in the workplace; this compares with 56% of Democrats. And Democrats are somewhat more likely to say high tuition is a major reason the system isn’t working (92%, compared with 77% of Republicans). Many respondents also volunteered that there are other major reasons, besides the four offered in the survey. These include students not being taught to think for themselves, affirmative action and a lack of adequate funding. While Republicans of all ages are about equally likely to say higher education is going in the wrong direction, younger Republicans who express this view are less likely than their older counterparts to cite professors bringing their social and political views into the classroom, colleges and universities being too concerned with protecting students from potentially offensive views, and students not getting the skills they need for workplace success as major reasons why. For example, practically all Republicans ages 65 and older who say higher education is on the wrong track (96%) say professors bringing their views into the classroom is a major reason why, compared with 85% of those ages 50 to 64, 73% of those 35 to 49 and 58% of those 18 to 34. Younger and older Democrats who say higher education is going in the wrong direction generally give similar explanations for why they think this is the case, but Democrats 65 and older are more likely than their younger counterparts to cite professors bringing their political and social views into the classroom as a major reason. About a third of Democrats who are 65 and older (32%) say this, compared with 15% of those ages 50 to 64, 10% of those 35 to 49 and 18% of those 18 to 34. When asked about the trade-off between allowing free speech, however distasteful, on college campuses versus protecting students from views they may find offensive, the public comes down clearly on the side of free speech. A large majority of adults (87%) say it’s more important to allow people to speak their minds freely, even if some students find their views upsetting or offensive, than it is to ensure that students aren’t exposed to views they find upsetting or offensive, even if that limits what people are allowed to say (11% chose this response). Republicans and Democrats are largely in agreement on this issue – 91% of Republicans and 86% of Democrats say it’s more important to allow people to speak freely. Note: See topline results and methodology here (PDF).